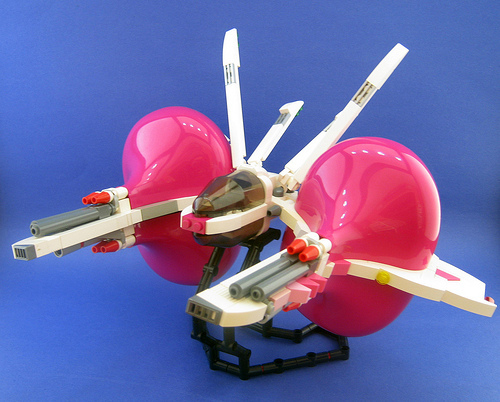 Bisonfuehrer‘s Vic Viper for the Missing Man display at BrickWorld 2010 has pink bubbles that remind me of a bubble eye goldfish. It’s one of the most innovative space creations I’ve seen in a while; the use of the onion dome certainly tops the chart for creativity. I love the sleek skeletal frame, but most of all, I like its testicles. I really want to make a vic viper for the formation…but there’s a bunch of problems in the way. The best I could do is make some horrible thing in LDD that might slightly resemble a ship. Very cool. Although I can’t help thinking it’s mating season.